"Use left-overs for Corned Beef Hash the next morning!" Place the onions, potatoes and carrots into a 5-6 qt. slow cooker. Place corned beef, fat side up, on top of vegetables and sprinkle with pickling spice packet garlic, bay leaf, sugar, vinegar, and pepper. Add enough water to just cover brisket. 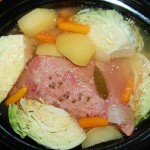 Cover and cook on HIGH until corned beef is tender, about 4-1/4 hours OR on LOW for 8-1/2 hours. Arrange cabbage over corned beef, cover, and continue cooking until cabbage is tender, about 45 minutes on HIGH or 1-1/2 hours on LOW. Discard bay leaf. 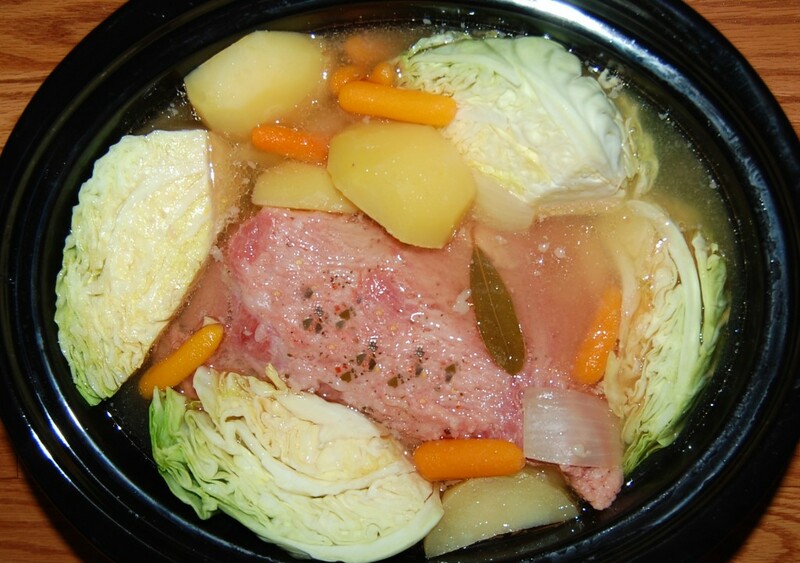 Thinly slice corned beef against the grain and serve with vegetables, cooking liquid, and grainy mustard.